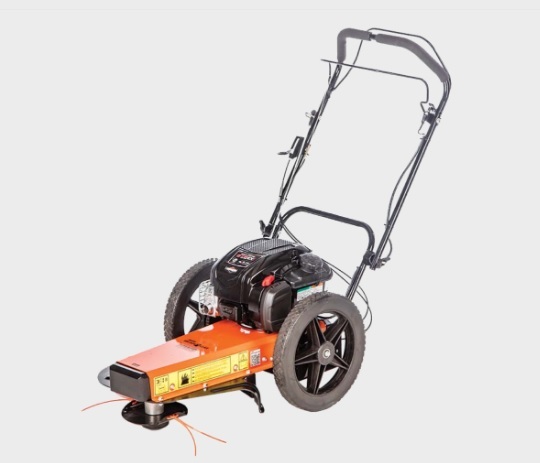 The ECHO Bear Cat HWSB high-wheeled trimmer replaces the popular Bear Cat WT190 high-weed mower and is a self-propelled model with a smooth 3 speed transmission. The Beat Cat HWSB has a 163cc Briggs & Stratton 675 EXi engine and offers comfortable operating speeds of 1, 1.5, and 2 mph and is an easy-to-use option for many terrains. The HWSB high wheeled trimmer comes standard with .155mil nylon cutting line, with specialty Triple Blade Brush Cutter and Sabre Tooth Blade kits available. The 14″ diameter Sabre Tooth Blade can cut saplings and small trees up to 4” in diameter while the 14″ diameter Triple Blade Brush Cutter makes short work of heavy weeds, cattails and underbrush.